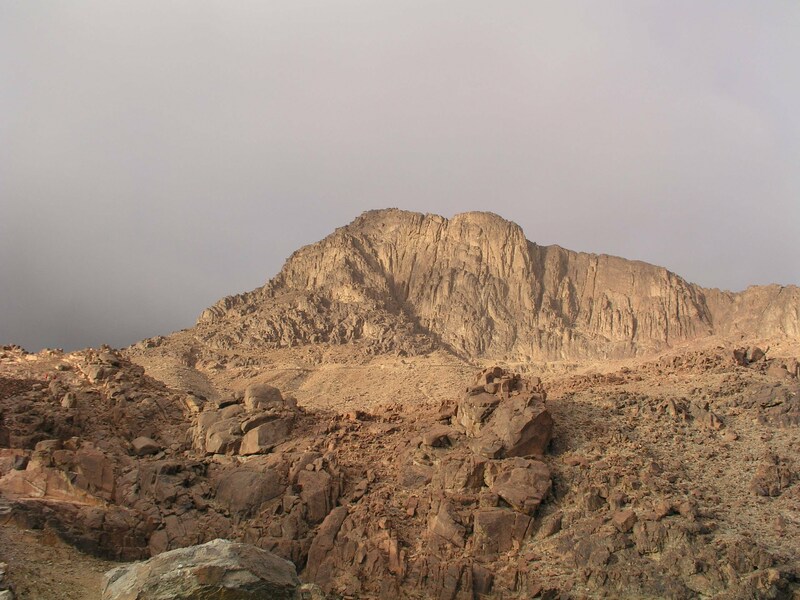 For the Biblical Mount Sinai, and a discussion of its possible locations, see Biblical Mount Sinai. For other places with the same name, see Mount Sinai (disambiguation). "Jabal Musa" redirects here. For other uses, see Jebel Musa (disambiguation). Mount Sinai (Hebrew: הַר סִינַי, Har Sinai; Arabic: طُور سِينَاء‎, translit. Ṭūr Sīnāʼ or Egyptian Arabic: جَبَل مُوسَىٰ‎, translit. Jabal Mūsā, lit. 'Mountain of Moses'; Classical Syriac: ܛܘܪܐ ܕܣܝܢܝ‎ or Classical Syriac: ܛܘܪܐ ܕܡܘܫܐ‎; Greek: Όρος Σινάι; Latin: Mons Sinai), also known as Mount Horeb or Gabal Musa, is a mountain in the Sinai Peninsula of Egypt that is a possible location of the biblical Mount Sinai, which is considered a holy site by the Abrahamic religions. Mount Sinai is mentioned many times in the Book of Exodus and other books of the Bible, and the Quran. According to Jewish, Christian, and Islamic tradition, the biblical Mount Sinai was the place where Moses received the Ten Commandments. Mount Sinai is a 2,285-metre (7,497 ft) moderately high mountain near the city of Saint Catherine in the Sinai region. It is next to Mount Catherine (at 2,629 m or 8,625 ft, the highest peak in Egypt). It is surrounded on all sides by higher peaks of the mountain range. Mount Sinai's rocks were formed in the late stage of the Arabian-Nubian Shield's (ANS) evolution. Mount Sinai displays a ring complex that consists of alkaline granites intruded into diverse rock types, including volcanics. The granites range in composition from syenogranite to alkali feldspar granite. The volcanic rocks are alkaline to peralkaline and they are represented by subaerial flows and eruptions and subvolcanic porphyry. Generally, the nature of the exposed rocks in Mount Sinai indicates that they originated from differing depths. Mount Sinai depicted on late medieval Georgian manuscript. The biblical Mount Sinai is one of the most important sacred places in the Jewish, Christian and Islamic religions. According to the Hebrew Bible, it was the mountain where God gave laws to the Israelites. However, the earliest Christian traditions place this event at the nearby Mount Serbal, at the foot of which a monastery was founded in the 4th century; it was only in the 6th century that the monastery moved to the foot of Mount Catherine, following the guidance of Josephus' earlier claim that Sinai was the highest mountain in the area. The earliest references to Jebel Musa as Mount Sinai or Mount Sinai being located in the present-day Sinai peninsula are inconclusive. There is evidence that prior to 100 CE, well before the Christian monastic period, Jewish sages equated Jebel Musa with Mount Sinai. Graham Davies of Cambridge University argues that early Jewish pilgrimages identified Jebel Musa as Mount Sinai and this identification was later adopted by the Christian pilgrims. R. K. Harrison states that "Jebel Musa . . . seems to have enjoyed special sanctity long before Christian times, culminating in its identification with Mt. Sinai." Christians settled upon this mountain in the third century AD. Georgians from the Caucasus moved to the Sinai Peninsula in the fifth century, and a Georgian colony was formed there in the ninth century. Georgians erected their own churches in the area of the modern Mount Sinai. The construction of one such church was connected with the name of David The Builder, who contributed to the erection of churches in Georgia and abroad as well. 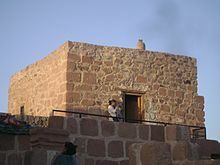 There were political, cultural, and religious motives for locating the church on Mount Sinai. Georgian monks living there were deeply connected with their motherland. The church had its own plots[clarification needed] in Kartli. Some of the Georgian manuscripts of Sinai remain there, but others are kept in Tbilisi, St. Petersburg, Prague, New York City, Paris, or in private collections. View down to the Saint Catherine's Monastery from the trail to the summit. Some modern biblical scholars[who?] now believe that the Israelites would have crossed the Sinai peninsula in a direct route, rather than detouring to the southern tip (assuming that they did not cross the eastern branch of the Red Sea/Reed Sea), and therefore look for the biblical Mount Sinai elsewhere. According to some scholars[who? ], the Song of Deborah suggests that God dwelt at Mount Seir, so many scholars[who?] favour a location in Nabatea (modern Arabia). Alternatively, the biblical descriptions of Sinai can be interpreted as describing a volcano, and so a small number of scholars[who?] have considered equating Sinai with locations in northwestern Saudi Arabia, such as Jabal al-Lawz, as there are no volcanoes on the Sinai peninsula. Saint Catherine's Monastery (Greek: Μονὴ τῆς Ἁγίας Αἰκατερίνης) lies on the Sinai Peninsula, at the mouth of an inaccessible gorge at the foot of modern Mount Sinai in Saint Catherine at an elevation of 1550 meters. The monastery is Greek Orthodox and is a UNESCO World Heritage Site. According to the UNESCO report (60100 ha / Ref: 954) and website hereunder, this monastery has been called the oldest working Christian monastery in the world – although the Monastery of Saint Anthony, situated across the Red Sea in the desert south of Cairo, also lays claim to that title. There are two principal routes to the summit. The longer and shallower route, Siket El Bashait, takes about 2.5 hours on foot, though camels can be used. The steeper, more direct route (Siket Sayidna Musa) is up the 3,750 "steps of penitence" in the ravine behind the monastery. The last few meters of the climb up Mount Sinai. The summit of the mountain has a mosque that is still used by Muslims. It also has a Greek Orthodox chapel, constructed in 1934 on the ruins of a 16th-century church, that is not open to the public. The chapel encloses the rock which is considered to be the source for the biblical Tablets of Stone. At the summit also is "Moses' cave", where Moses was said to have waited to receive the Ten Commandments. ^ Joseph J. Hobbs, Mount Sinai (University of Texas Press) 1995, discusses Mount Sinai as geography, history, ethnology and religion. ^ "Tafsir Ibn Kathir". qtafsir.com. 2002-10-26. Retrieved 2015-01-30. ^ "Mount Sinai, Egypt". Places of Peace and Power. Wikimedia Commons has media related to Sinai. Caucasian Albanian Alphabet Discovered and Deciphered, Azerbaijan International, Vol. 11:3 (Autumn 2003). Six articles. Map of Mount Sinai, 18th century. Eran Laor Cartographic Collection, National Library of Israel.